Richloom Fabrics Group, a family-run business for over sixty years, understands the needs of specialty retailers in the casual furniture industry. In 2004, Richloom created the Solarium Division (one of nine within the company), which focuses on outdoor fabric. Solarium’s solution-dyed fabrics have been praised for their durability as well as their style. Here are some Solarium fabrics that are popular with consumers. 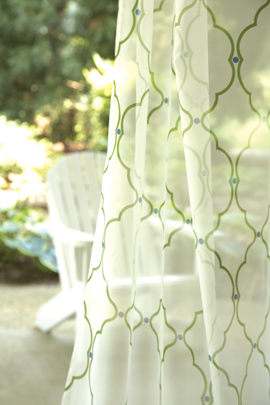 Solarium’s new decorative outdoor sheer collection has approximately 17 SKUs, mixing traditional to transitional looks. The sheers are all 100% polyester, are fade resistant, and have a water-repellent treatment, making them perfect for an outdoor room or a finishing touch to a gazebo. Solarium takes a modern approach to the outdoor room with a khaki and charcoal red color story. The collection includes Maxfield sand on the sofa cushions with a contrasting welt, using solid Cambria cherry. The printed pillows feature Paisley, Grovedale ebony, and Morris ebony stripe. All the prints are on 100% polyester base =cloth and are weather resistant.